I confess. I'm a programmer. I know that's a dirty word. Even worse a "computer programmer". Of course, the whole notion is obsolete nowadays. These days we're dealing with clouds, quasi clouds, and virtual clouds. The ultimate service-oriented cumulus. The whole thing sounds like a job for a meteorologist to me. And I guess that's the point. It's all getting a bit to removed for my taste. What's the proper parlance these days? 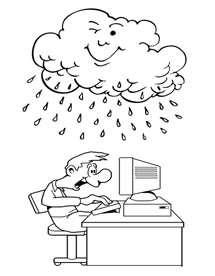 "Cloud coordinator" or is "web developer" still in vogue? They tell me the job now consists of providing a service by instructing the client to make requests out to the Cloud. Wow! the client, the browser, the cloud ... What are we talking here? Its all a little too much like long distance dating. I was a little taken back when they stuck the operating system in between me and my central processing units and devices. At first that additional layer of software got in the way. After being so intimate with the registers, interrupts, channels, flags, hex values, and assembly language, the operating system kind a made things less personal. Eventually I made my peace with it, but it took a while. But since then its been a steady push away from the details of the actual computer I'm instructing. Less and less personal. Yes, I was on a first name basis with the Motorla 6809 and 68000. Sun's Ultra Sparc was almost family. Oh, how things have moved in the other direction. The Cloud and the client (sounds like a movie)-- that's all that's left. The cloud man (or whatever he's called these days) tells the browser what to do using some kind of action/display script. The action script kind-a talks to a generic model of the browser. The generic model then communicates to the actual browser. The browser then makes a request of the user-level of the operating system. At some point that user-level operating system request makes its way (supposedly) to the kernel level of the operating system. The kernel then makes requests of one of the cores. The core (I guess) is probably the closet will ever get again to a Central Processing Unit (CPU). The core executes the instruction. From there the instruction(s) goes out into the Cloud. When I think about the layers between the Cloud and the actual CPU on the other side of the network connection, I'm actually horrified. And I would be right up against the silicon. But now, I'm stuck with a cloud and a bunch of cores. I recently was interested in purchasing one of those new IPADs (I guess it's a computer). I asked the salesman "What kind of CPU does it have?" "How many CPUs does it have?" The blank stare on his face was priceless. Yep, you don't get any more abstract than his blank stare.